Step 1: Download, install and activate TouchCopy 16. Step 3: Press the "Backup" button in the control bar at the top of TouchCopy. Step 4: Select where you would like to backup to, and backup. TouchCopy lets you copy your music, playlists, podcasts, videos and more to your computer or directly into your iTunes library. 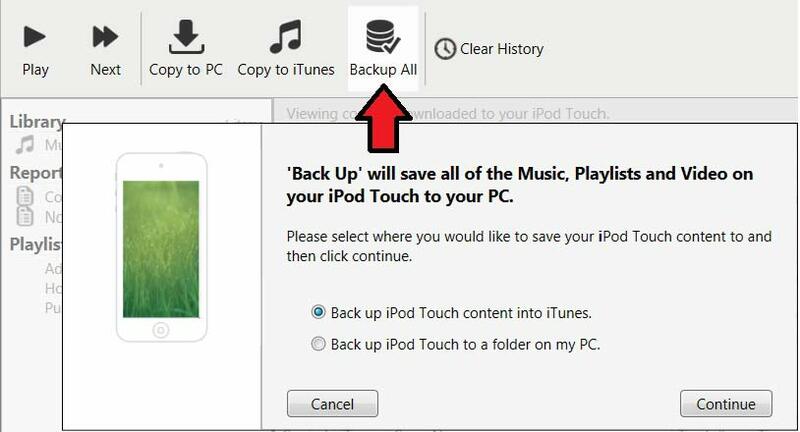 You can select individual items to copy from your iPod or iPhone, as detailed here, but you can also backup all the multimedia content in your device in a couple of mouse clicks! Click the "Backup" button on the TouchCopy Control Panel. The Backup button is only available for registered TouchCopy users. Select where you want your iPod content to be placed: In a folder on your computer, the location of which is specified in the Options Window, or directly into your existing iTunes library. Then, connect your iPod or iPhone and use iTunes to re-sync it which will reload your music to your device.